One of the big draws for me about MAGFest and other conventions are the panels. It’s always great to hear about new things happening in the industry and it’s a good way to learn about different topics from people who’ve had some experience. A majority of the panels that I attended were focused on music making and game audio. I did however attend some Q&A sessions featuring some of the online content creators. Obviously I can’t really talk about the panels that I didn’t go to, since many panels occur simultaneously. What I will do, is tell you a little about some of the events I did attend. Hopefully this gives you a good sampling of what happens at these conventions/festivals. The first day of MAGFest didn’t officially start until 1 p.m. so there were only a few panels to go to on that day. The first was the “Opening Hijinks” event, which I talked about in the previous MAGFest post. A very laid back panel featuring many of the individuals who help run the show. Since many people in the audience were experiencing their first MAGFest, including myself, they went over the history of the festival and explained how it’s changed and evolved. The next panel that I attended that day was “Music from a Dozen old Sound Chips” hosted by chiptune artist Inverse Phase. His presentation focused on the different sound chips used in video games over the years, from the Atari to the Sega Genesis. He covered the different attributes and capabilities of the chips including each chip’s specific pitch and amplitude resolutions as well as some of the unique quirks that they each have. The panel also featured a surprise appearance of Yuzo Koshiro, the composer for Ys and Actraiser, who entered the room just as Inverse Phase was discussing the PC-88 chip. This happened to be the very sound chip that Koshiro is considered the master of in terms of music composition. Despite this surprise, Inverse Phase continued his presentation, making sure to acknowledge Koshiro’s accomplishments with the medium. I got the chance to talk with Inverse Phase later in the week at his market booth. We got into some great discussions about music writing and our favorite old school video game soundtracks. He even showed me some of the trackers and sound sampling he had done for his own chiptune music. It was great to chat with a fellow musician and to check out his music. If you’re a fan of chiptunes or old-school game music, definitely check out Inverse Phase’s Bandcamp site. Friday’s first panel was the Q&A session for composer Yuzo Koshiro. I was very surprised that this event was not very crowded. I got the feeling that many people at MAGFest were not familiar with this composer’s work. This panel was only half full when it started but some late arrivals wandered in as it continued. Due to my anticipation of a large crowd for this panel, I had actually arrived earlier than I really needed to. This resulted in my brother and I snagging front row seats for this Q&A session. Koshiro had an interpreter with him, since he speaks only a little bit of English. Most of the audience’s questions focused on what inspired him, what he found difficult about composing on older systems, and how he came up with music to write. He said that for the most part he has been influenced by trance and various types of dance music, which he incorporates into his music in different ways. He also wrote many of the software programs that he used to create music for the games. I was very surprised at how much the audience members knew about his work, even down to the computer systems that he used to program music. Koshiro seemed to enjoy the feedback he got from the fans about the music and it was great to hear about music writing from one of the early greats. Koshiro’s DJ performance on Saturday night. The next panel I went to that day was on the Twilight Symphony, a fan made Zelda album featuring the music from The Legend of Zelda Twilight Princess. The panel focused on the processes and procedures they’ve had to go through to get the album made and to get permission from Nintendo to release the album. The three and a half hour long album was arranged and recorded using a mixture of live instruments and virtual instrument libraries. Everything on the album including the artwork has had to go through various channels to get final approval from Nintendo. As of the day of that panel they had just sent a copy of the album to Koji Kondo, one of the composers for the original game soundtrack. I’ll be looking forward to the album’s release, assuming everything else goes well. Be sure to check out some of the album’s tracks at their site here. The final panel for the second day was probably one of the longest panels I’ve ever experienced and for good reason. This was the “Extra Credits Q&A” which has a reputation for going on much longer than originally scheduled. The panelists James Portnow, lead writer, and Daniel Floyd, narrator and editor, were willing to keep the Q&A going until they had answered EVERY question that audience members had. This resulted in this session of Q&A lasting around 4 hours. Just about every subject you could think of relating to games came up for questions. Everything from the future of gaming, the WiiU, politics, the scapegoating of violent games, religion in games, the show’s future, and many other subjects were brought up for discussion. This was apparently the first time that they’ve had a Q&A session where all of the audience questions were answered. Despite the long running time, it was great to have all the time we needed to question Dan and James. This was probably my favorite panel at MAGFest. The earliest panel I went to on Saturday was the Q&A for Kinuya Yamashita, composer for Castlevania and Mega Man X-3. This Q&A had more people in attendance than Koshiro’s, which was nice to see. Many of the questions that audience members asked Yamashita were similar to ones asked for Koshiro the day before. Her primary influences for music, if any, have been from classical music, when she was learning to play the piano. She stated that if there are any influences on her music, they are only on a subconscious level. She never actively tries to imitate anything else she hears in other people’s music. She just writes what she hears in her head. 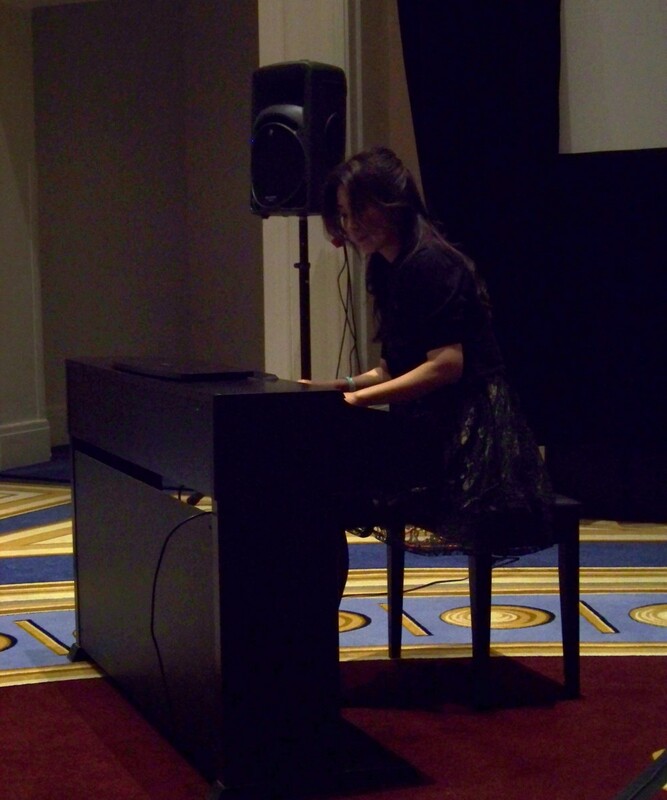 The panel ended with a brief performance by Yamashita of “Blizzard Buffalo” from Mega Man X-3 on piano. 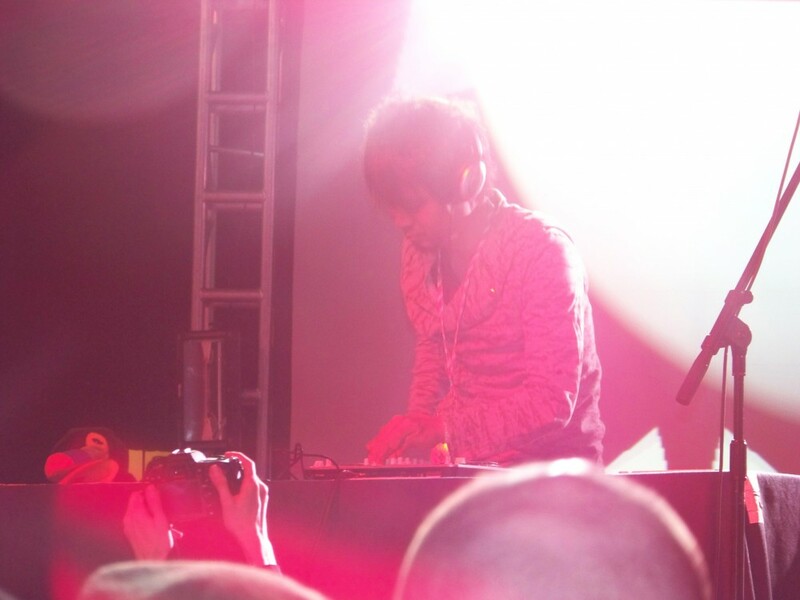 Kinuyo Yamashita performing music from Mega Man X-3 at MAGFest. The final panel that I attended at MAGFest was on Sunday morning and was titled “Going Pro: The Business Side of Quitting Your Job and Making Things”. I expected it to be a boring panel on knowing the tax code and recording business expenses. But since I do want to eventually write music as a freelancer, I felt this was a panel I needed to go to. The speakers for this panel were not listed, but I expected it to be run by someone I had never heard of talking about the tools needed for succeeding. What I actually got was a very pleasant surprise. The panelists among others included Lindsay Ellis (Nostalgia Chick), Todd Nathanson (Tod in the Shadows), Lewis Lovehaug (Linkara), and Brent Black (Brentalfloss). Each panelist talked about their own experiences becoming of independent creators and the challenges and rewards that come from being your own boss. One of the biggest elements that they stressed was that there is a lot more work on the business side than most people think. About 80% of what they do has nothing to do with the actual creative process of the content that they produce. A lot of time is spent sending and responding to emails, dealing with financial information, and other responsibilities that are necessary to keep their businesses running as smoothly as possible. It was great to hear some firsthand accounts about working for yourself at home from people who are still actively doing it. While I don’t think they were trying to truly discourage anyone from attempting to do what they do for a living, they did present a very sobering view of what their jobs are like. If you really want to become your own boss, there’s a lot of hard work that has to go into what you do. Especially behind the scenes. It was a great panel and I came away with a lot of helpful information and advice. I attended a fair number of panels at my first MAGFest. I thought that every panel I went to was well done, very informative, and featured some great panelists. There were plenty of events that I really wanted to go see, but couldn’t due to scheduling conflicts with other events. A few that I wanted to see but missed out on included Egoraptor and Game Grumps Q&A, the Team Nostalgia Chick Q&A, and a handful of others. However, I really enjoyed the panels that I was able to go to. If you’d like to see some of the panels from MAGFest 11, a handful of them were taped and can be found floating around on the internet. Some of these panels include Game Grumps, Team NChick, and The Game Overthinker. Be sure to check out some of these and other panels from MAGFest 11. If you’re ever at a convention, the panels are almost always worth checking out. They’re a great experience and always a ton of fun. This entry was posted in Video Game Music and tagged Extra Credits, Inverse Phase, Kinuyo Yamashita, magfest, music, Twilight Symphony, video game music, video games, Yuzo Koshiro by Michael Hoffmann. Bookmark the permalink.